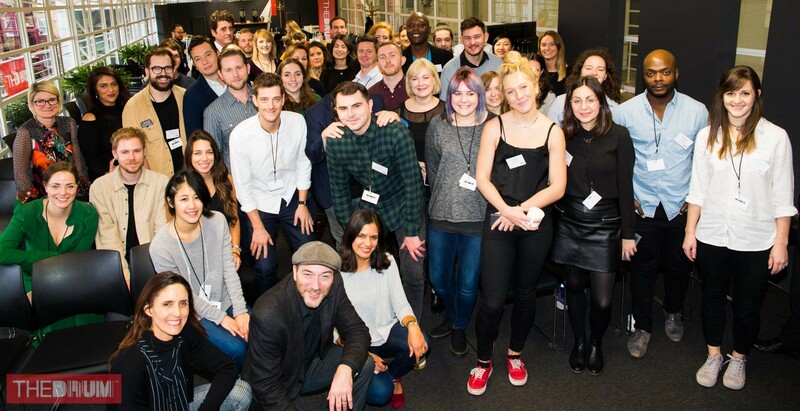 The Drum’s ‘Do It Day’ is all about using marketing to destigmatise mental health. Many people from agencies, technology companies and publishers gathered their creative ideas to produce six different advertising campaigns for six different charities. Amongst those people were Coull’s Product Manager Ben Sonnex and Coull’s Marketing Executive, Naomi Sandercock. Naomi and her group were working with the YoungMinds charity, a charity that aims to help raise awareness of mental health among young children. Their campaign ‘Take20’ encourages parents to take 20 minutes a week to do an activity with their children. This time can be used to talk to their child about how they’re feeling, whilst doing something that they both enjoy. Whatever the activity, having regular conversations in a relaxed space can help parents to provide reassurance and support from a young age. 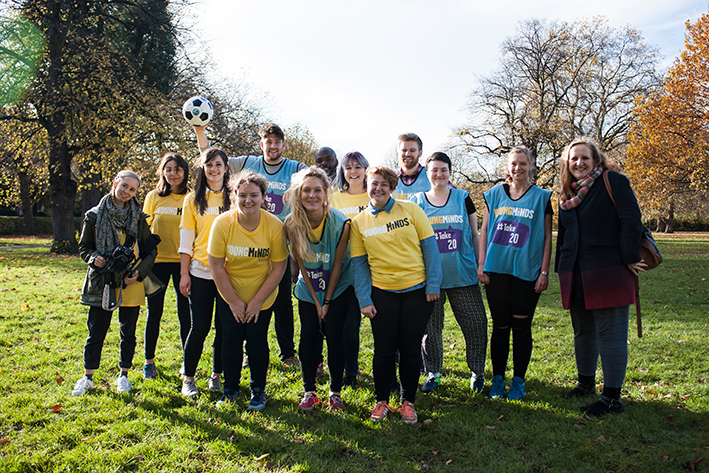 They launched the campaign by taking their own advice and taking 20 minutes to have a football game in Regent’s Park and inviting members of the public to also ‘take20’. The campaign has caught the attention of the media and has already been covered by Huffington Post, The Metro and The Sunday Mirror (being printed this week). The Mix was the charity that Ben and his group created a campaign for. The Mix aims to provide mental health support for under 25s. A study by The Mix found that three in four under 25s believe they are misrepresented in the news media. 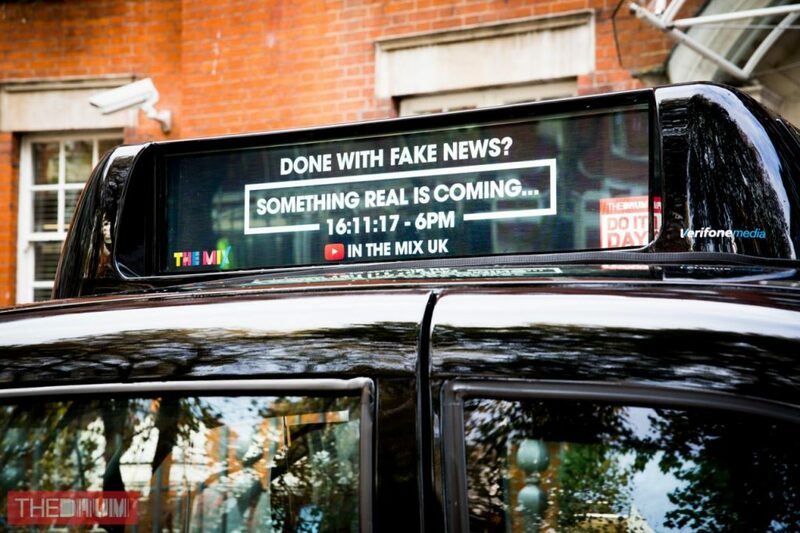 Based on this research, the campaign ‘In The Mix’, set out to disrupt the negative news agenda by creating a different 6 o’clock news bulletin, produced with young people, for young people. YouTube stars, Niki and Sammy, presented the show and made appearances on Sky News on the lead up to the 6pm bulletin. Not only this, the team did a Kiss FM takeover for an hour on Launch Day and called in favours to secure advertising space on huge outdoor billboards in London. They promoted their first bulletin with a mysterious message: ‘Done with Fake News? Something Real is Coming…16/11/17 – 6pm’. This campaign was voted the winning Do It Day campaign by the judges and will now provide a lasting legacy for The Mix with fortnightly ‘In The Mix’ shows. You can read about all of the Do It Day campaigns here. Did Facebook really rip off its video advertisers? Did Facebook really rip off its video advertisers? No. It’s a complete non-story. These stories have been hyped by poor research and sensational headlines, suggesting Facebook did something fraudulent. Journalists have been quick to jump on the bandwagon and feeding off the initial story without doing there on research. Here’s some context to help break this story down. Facebook only charges marketers when users watch their video ad for 3 seconds or more. They use a metric called ‘Average Duration of Video Viewed’. Any right-minded person would naturally assume this only included those ads classed as a ‘view’. Unfortunately, Facebook’s documentation was wrong. Previously, the ‘Average Duration of Video Viewed’ = total time spent watching a video ÷ total number of people who have played the video. Now, the ‘Average Duration of Video Viewed’ = total time spent watching a video ÷ number of views of the video, for 3+ seconds. Realistically, marketers shouldn’t base buying decisions on this metric alone. Facebook hasn’t changed any code to correct this, only their terms and conditions. Therefore, careful consideration must still be applied when making purchases. 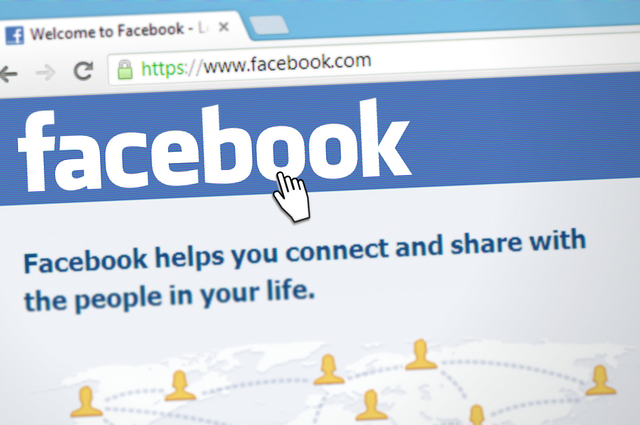 Is Facebook advertising completely flawed? Let’s not get carried away too. Facebook’s newsfeed ads are fed by its data, therefore making it the greatest ad format ever invented. Marketers can easily see if the ROI and so if they’re not seeing results they won’t buy more. The real story isn’t a metric miscommunication or blunder – it’s a much bigger issue. The debate is about walled gardens and transparency. Does Facebook provide enough transparency for their own verification? Well, Facebook recently announced limited partnerships with Nielsen, Integral Ad Science and comScore to provide transparency. For Facebook, it’s a question of user data because that’s their USP. Controlling data and protecting their users will ensure they continue to spend time in the app. However, opening doors to too many vendors and knocking down their walled garden will put that at risk. Facebook is trialling mid-roll advertising for Facebook Live and we’re supposed to be impressed? Facebook Live is trialling mid-roll ads and we’re supposed to be impressed? Facebook has announced a monetising solution for Facebook Live: mid-roll. 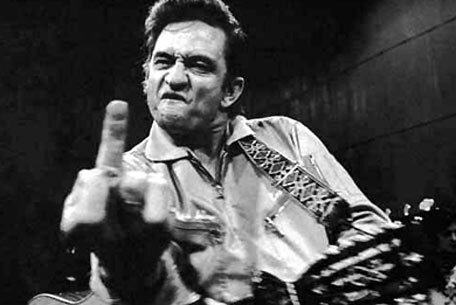 But we’re far from impressed. Facebook is the powerhouse of walled garden networks. Publishers have been lured to the garden and are essentially handing their distribution over to Instant Articles for instant reach. But how will this affect publishers long-term? Whilst reach seems to be increasing, engagement and time spent visiting the publisher’s sites is declining. The model is pushing publishers to create snackable content for Facebook feeds, rather than the stories they’d have invested talent and research in. Ad dollars are generating revenue, but is that revenue helping the longevity of publisher brands? Advertisers are lining up too, all eager to dive into the deep end of Facebook’s brand pool. But many may find their messages hugely diluted. And their data? Well, it’s Facebook’s data now. The latest news from Facebook is that they’ll be introducing mid-roll advertising to Facebook Live. It’s being sold as a positive story, but we’re calling them out on it. No Facebook, just no! Facebook has jumped on live streaming video because it’s the popular flavour right now, and for a very good reason. But their advertising plans are confusing. Like pairing a fine vintage wine with 2-minute noodles and expecting people to be impressed. We’re not. It’s not too difficult to coerce influential celebrities and media companies to get involved in creating live stream content. Not if there’s a hefty paycheck involved anyway, and that’s what Facebook has offered. 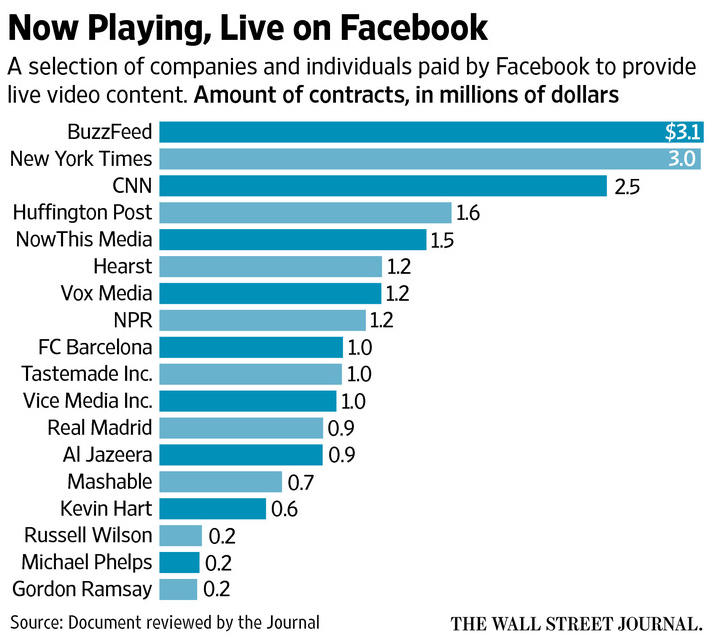 The budget set aside for paid live stream content was $50million. Various chunks of the budget are dedicated to attracting very specific media companies such as BuzzFeed and celebs like Gordon Ramsay. It may seem a lot but it’s not an epic amount when you consider the amount of content required and the percentages set aside for publishers. And what happens when that $50million runs out? Enter advertising, the solution that’s been keeping content free whilst also paying creators for years. Perfect. Well, it could be, but again – no! Facebook’s consideration of the publisher and their audience’s experience seems to be non-existent. Zuckerberg has always been averse to the idea of pre-roll advertising because according to him it ‘ruins the viewing experience’. However, whilst pre-roll may not be the ideal ad format for all audiences, it’s a non-interruptive format because it sits before content. What ruins viewing experiences is an interruption. Mid-roll is an interruption. It’s got the word ‘mid’ in it people! It doesn’t get more interruptive than that. But ‘The Berg’ isn’t concerned, that’s the very model he’s approved for Facebook Live advertising. The nature of live streaming is that it’s live! That’s why it’s so exciting. So putting an ad in the middle of a live stream seems rather inappropriate. Especially as the advertising industry is fighting hard to provide better ad experiences. It’s a backward step being taken by a huge network. There are much better options to monetise live streams and engage with audiences, and yes – Coull’s OverStream formats are some of those. We’re not going to shy away from the fact we care about audiences and our publisher’s content. Our audiences deserve better than mediocre, interruptive monetisation solutions from the biggest social platform on the planet. Advertisers and publishers do have a choice. Stop jumping in that pool. It’s tainted and it’s only a matter of time before the blue dye stains everything. In this latest Coull Quickie, Elise reports on linear television and programmatic video ad tech coming together, Facebook officially burying LiveRail, Snapchat increasing the price of its inventory due to the interactive vertical video ad format and the good news for programmatic in the UK. Find out why in this short, but sweet, Coull Quickie. In this month’s Coull Quickie we look back at the biggest video ad news from the month of March. Join Elise for this quick rundown of programmatic video industry stories including Facebook’s new video ads within Instant articles, Tube Mogul hits out at Google with it’s ‘Independence Matters’ campaign and the CMA cracks down on the labelling of advertising within editorial. All these stories and more in this month’s quickie. 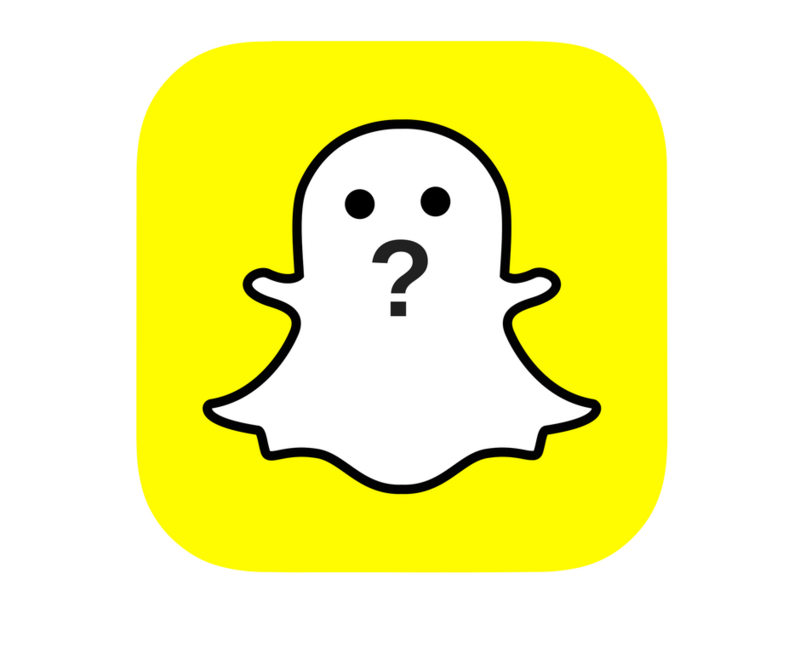 In January’s Coull Quickie Elise looks back over the month of video ad news including the IAB’s updated OpenRTB guidelines, Spotify’s video content, Instagram and Twitter’s emphasis on video and Sky Media’s investment in DataXu. As part of our new content-series looking at video markets across the world we’d like to look into Latin America, a region that has caught the attention of advertisers and marketers lately because of it’s significant growth in digital media adoption over the past few years. Latin America has the fastest growing internet population of the five global regions and is expected to grow by nearly 100 million users in the next three years. 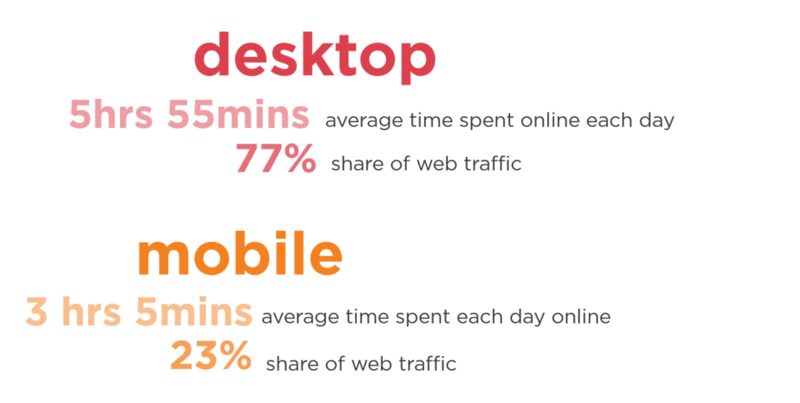 By today’s figures, that will be an increase of 63% to 394 million users (eMarketer). 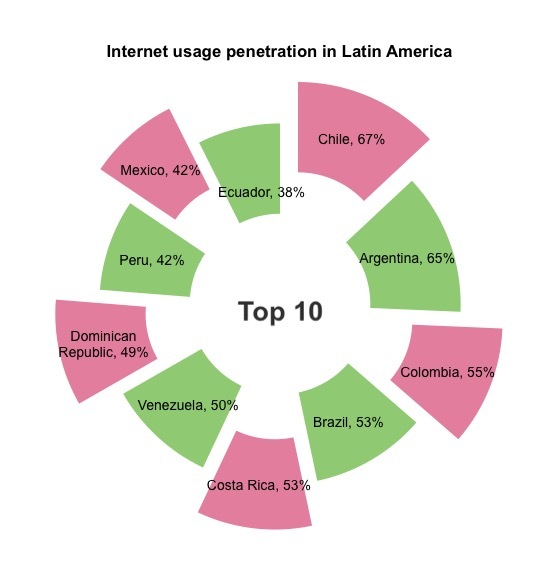 People in Latin America spend an average of 21.9 hours per month online. Across regions, this ranks them third only to North America (32.6) and Europe (21.9). Now, with a population of 614.8 million, Latin America is a pretty large area to cover, so to get the most value out of my word count limit, I’ve decided to focus my attention on the country known for it’s carnivals, beaches, soccer, rainforest, samba and coffee – the one and only Brazil. A staggering 40% of Latin America’s 169 million internet users are in Brazil. Brazilian consumers watch 176.6 videos each month on average. 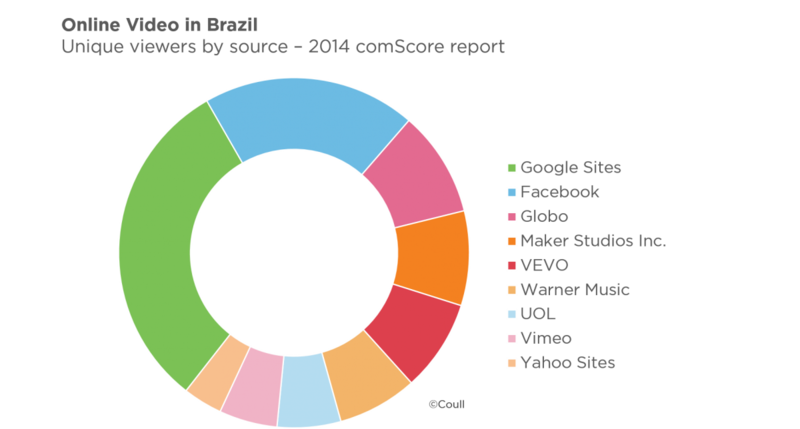 Comscore conducted a study last year which found that Brazil (at the time of research) was the seventh largest online video market worldwide, with a viewing audience of 43 million in December 2012. Being the only country from Latin America making the top 10 of this list and with 82% of internet users watching video in a month, it’s clear that Brazil poses a fantastic online video advertising opportunity for advertisers and publishers. Whilst Google Sites (consisting mainly of YouTube) certainly leads the way as the most popular video platform, the report also identifies that Youtube has a lower share of videos being watched this year than in 2013. In contrast Vevo, Globo (the largest mass media group of Latin America) and Facebook have a higher share of videos than they did last year. However, YouTube is still the distant leader of online video consumption in Brazil, gathering more than 62 million viewers per month, followed by Facebook videos with 39 million unique viewers per month. Why is video consumption on the rise? The reasons behind the rise of video consumption in Brazil are clearly linked with the increase in internet usage, and are listed below. In recent years, the way the internet is accessed in Brazil has shifted from predominantly being used at work and in internet cafes, to more frequently used at home. This is because the price of PCs and laptops has lowered, enabling emerging social classes to afford these devices at home. Not only that, government plans focused on digital inclusion such as Programa Nacional de Banda Larga reduced the cost of home broadband connections in all regions of the country, encouraging previously unconnected families to acquire their first internet subscription. Data from Anatel shows that as of August 2014 Brazil held 23 million fixed broadband connections (TechinBrazil). The introduction of low cost smartphones and tablets and the further reduction of cost for these devices brought by government initiatives such as Lei do Bem, has meant a huge increase in mobile usage. In 2013, sales of smartphones in Brazil grew by 123% with over 35 million of these devices sold to consumers, an increase that surpassed both the government and market expectations. Rapid expansion of mobile networks and the availability of 3G has resulted in smartphone usage in Brazil to increase greatly since 2012, with eMarketer predicting a 36% increase this year from last, and a further 27% increase in 2015. Brazil and Mexico are the largest contributors to Latin America’s expanding smartphone user base, adding 10.9 million and 6.1 million respectively in 2014. By 2017, it’s predicted that there will be 70.5 million smartphone users in the country. This huge 2014 sporting event, along with the 2016 Summer Olympics, called for aggressive infrastructure upgrades which ultimately has set it apart from any other market in the region. In terms of video consumption, Brazilians watched 21% more sports videos and spent 53.7 minutes per viewer consuming video content, an increase of 39% (comScore). Brazil is a lucrative market for advertisers, with clear evidence of an increased interest in video and a huge increase in internet usage amongst the majority of the population. Socioeconomic factors such as government intervention, funding, and the effects of major events such as the World Cup, the upcoming Olympics and increasing tourism has helped develop Brazil’s infrastructure to support heavy internet usage throughout the home and through mobile. The culture in Brazil has shifted from the internet being used more for informational and educational purposes to entertainment. Social media is extremely popular amongst Brazilians, and therefore entertainment and news videos are being watched more and more. As we have seen from this post, with nothing but positive rising figures all around, there’s only one way that this market can go, and that’s up. Brazil is certainly a maturing market for video advertising and that is an exciting prospect for media companies, ad tech vendors and advertisers alike. In the latest Coull Quickie Elise talks about the acquisition of Twitch and Ooyala and the race between Nielsen and ComScore to come up with attribution metrics to help marketers understand the monetisation of mobile content. She also looks at the latest developments from the social media world.